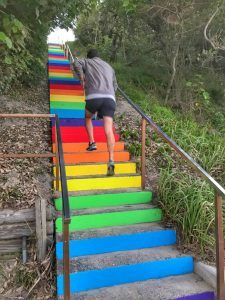 Rainbow steps for Rainbow Beach! Well done, Team Rainbow. The stairs leading to the patrol tower and beach from Lawrie Hanson Park were painted in the colours of a rainbow, last month. When this photo was taken, delighted German tourists were photographing the steps. This image has been been shared 30 times on the Community News Facebook page and has 40 comments, all positive, some saying it “makes that horrible climb, slightly better”, “brilliant idea” and “how fun”! 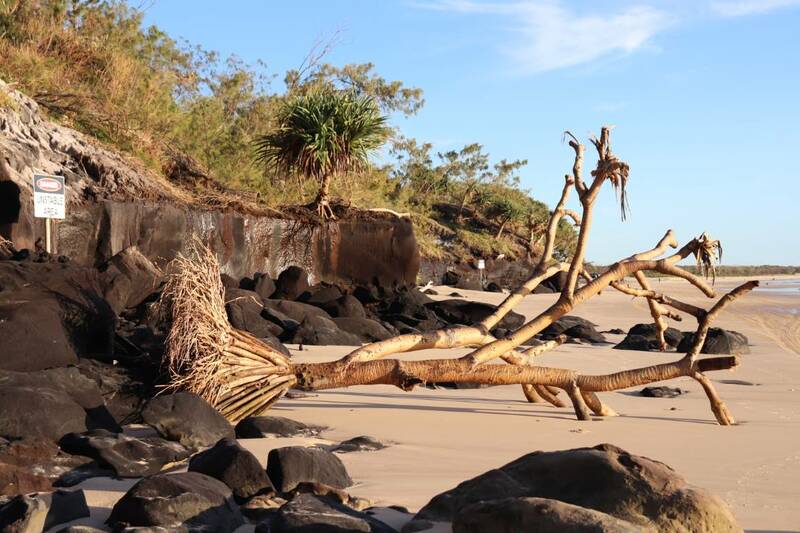 In May and June, several Pandanus palms will be removed from the Rainbow Beach foreshore due to safety concerns. The areas surrounding the palms have eroded, potentially destabilising a number of trees between the Surf Club and the southern end of Phil Rogers Reserve. These pose a risk to community members who use the plants as a shelter. 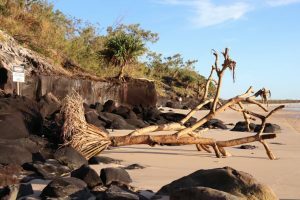 The trees were identified as hazardous in Council’s regular tree safety inspection program and an assessment of the foreshore Pandanus was undertaken late last year. As a result, seven plants were identified as being at risk of failing. The palms, weighing between two and three tonnes each, were providing shade and overhanging the popular bathing area. Prior to Christmas, Council wire-cabled four of the plants, and trimmed two to reduce the risk to the public as a short term measure until a permanent solution was determined. Warning signs were also installed during the holiday period alerting visitors to the hazard. A number of other plants in the area will continue to be monitored and assessed for safety on an ongoing basis. To support ongoing Pandanus regeneration, Council staff has been collecting seeds from existing Pandanus to assist in developing future propagation programs for this iconic species and support dune revegetation programs. Where possible, Council will use locally grown plants (both seeds and transplants) to help reduce pest plants and disease that may arise from imported Pandanus plants. Council is in the early stages of preparing a Coastal Hazard Adaption Strategy which will help plan for future coastal hazard issues in conjunction with coastal communities. Council plan to develop strategies to help adapt to the impacts climate change will create. Until the removal of the plants, Council would like to stress to visitors to take care around the dune areas and pay attention to all signage and warnings. Do you want to reach new customers, apply real-time data analytics and run your business on the go? Technology can help you improve your business in many ways, the hard part is knowing where to start. A free workshop, designed to provide you with practical advice and digital skills to grow your business, will run 9am to 1pm on June 26 at the Gympie Civic Centre, Mellor Street Gympie. Discover current digital trends and how they impact your business. Learn how to use data for better business decision-making. Get tips for using online analytics tools to track your business performance and learn how to improve your online presence and customer experience. At the end of the workshop you will have an opportunity to spend 30 minutes with a digital expert to discuss your own digital plan. Pre-registration is essential. The Tin Can Bay Chamber Of Commerce Charity Dinner 2018 will be held August 18 at The Community Complex. As a precursor the popular Tin Can Bay Seafood Festival, this charity dinner raises thousands of dollars for local community organisations. Join the public group on Facebook to find out more or stay tuned for more details next month!